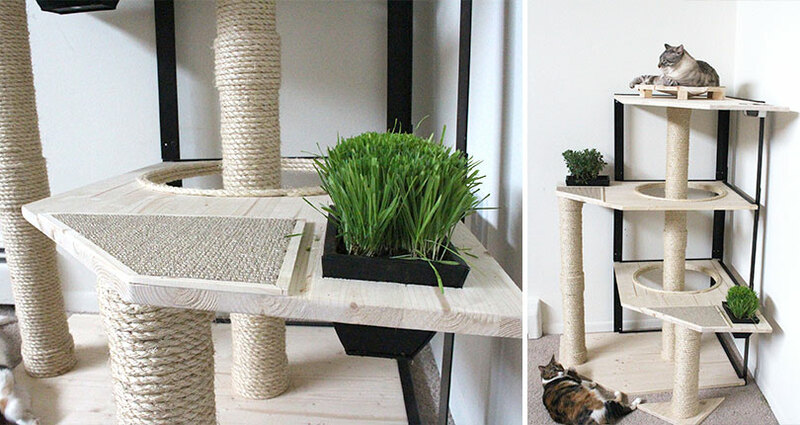 This was the first time we had incorporated live plants with our cat furniture. It was also our first real attempt at coming up with a cat tree design that could be mass produced. There were three different levels, and it was made so that a customer could start with a smaller version and then build on to it over time. We really liked the open design. There aren't a lot of solid wood cat trees on the market, so we were really excited about launching this piece. It came with a round fabric lounge at the top as well as a feeding area. The major issue with this tree was stability. Although it used steel braces, it did a weird twisting thing. So while we didn't believe it unsafe, we wanted it to be more solid than what's currently on the market, rather than launching a less stable design. We're still planning to do a collection of cat trees, but we have a couple of projects coming up before that. We need this in our life. Our kitty is in love with cat grass. And we would love to have a option for him with out drilling in to our walls. We hope to start working on our new cat tree design next year. We had issues with stability with this tree and the only way to stabilize it was increasing the frame’s size substantially. We thought this would look bulky, so we are back to the drawing board. Second the vote for more things with cat grass and little pots. Are they still on the launch list, any idea when it may come up on the market? Hi Joanne. At this time we don’t know when work will begin once again on the cat tree, but it’s not completely out of the question for the future. The major issue with this tree was stability. While we didn’t believe it unsafe, we want it to be more solid than what’s currently on the market rather than launching a less stable design. While “twisting thing” is rather vague I think you may be able to overcome it if you put a diagonal bar between opposite corners of each of the rectangular metal supports. Triangles are inherently rigid where rectangles are prone to collapse. I also really like the horizontal scratching areas next to the planters. I’d be great if you could incorporate this as options for some of your shelves. My cats seem to only want to scratch if they have something horizontal. 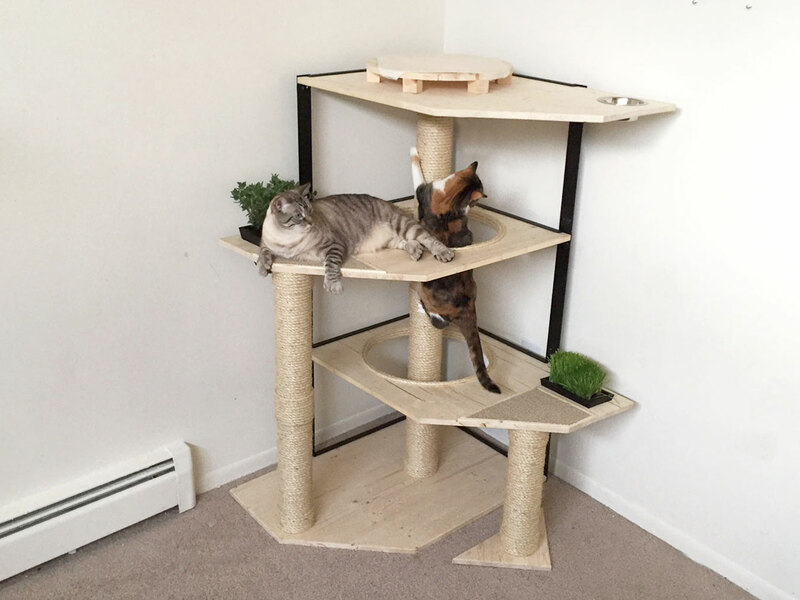 Cat trees are very useful for both felines and their owners because they provide the cat with a place to climb, scratch and play, and help you save your furniture from the claws of your pet. These kind of trees are available in various styles, so it is easy to find one that fits your feline’s needs, as well as your finances and preference. If you buy a kitty tree, you will provide your felines with many happy hours of play and comfortable relaxation. Get exclusive catastrophic creations, sneak peaks, customer features, new products & more.